John Basilone was born on November 4th, 1916. He grew up in the small town of Raritan, New Jersey. As a child, John was restless and had a sense of adventure from the beginning. After he graduated from 8th grade, John elected not to go to high school. He told people he was looking for adventure. However, after a few years, he had not yet found his adventure. So in 1934, he joined the Army, serving in the Philippines at the U.S. base in the city of Manila. It was during his tenure in the Army where John discovered a mechanical talent for guns, especially machine guns. He also learned to be a leader of men - with the ability to motivate and lead other soldiers. After his 3 year stint in the Army ended in 1937, John returned home to Raritan New Jersey, but after a couple years, he found himself restless and again searching for adventure. He decided to re-enlist in the service, but this time he would join the Marines. 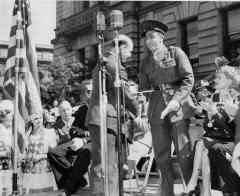 In August of 1942, (10 months into World War II for the U.S.) his group was sent to the island of Guadalcanal. 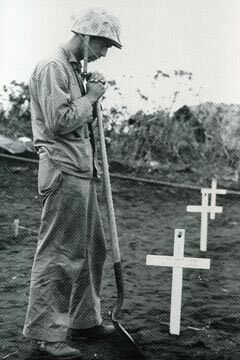 The U.S. and Japanese were battling for the island The U.S. had secured an important airstrip Henderson Field which the Japanese were determined to take. The Marines had only a fraction of the troops compared to the Japanese. Only a single U.S. Battalion stood between the readying Japanese Division and Henderson field. John Basilone was in charge of 16 men. They set up a defensive position with 4 heavy machine guns in front of Henderson Field. On October 24th, the Japanese launched a massive attack. John set the strategy for his unit. He told his men to let the enemy get within 30 yards and then “let them have it.” They fired at the first group of attacking Japanese, successfully wiping them out. This first charge was only the beginning of the overall enemy attack. They charged several more times. Eventually this attack took it’s toll. John, while manning the left two machine guns, heard a loud explosion come from the right setup of the machine guns. Moments later, one soldier from the right side crawled over and informed him that both right guns were knocked out and that the crew was all dead or injured. John knew he had to get to the knocked out guns to see if he could get them working. The first gun was beyond repair, but the second gun had a chance. There was no light to aid in examining the damaged gun. John would have to troubleshoot the problem in the dark, by feeling the parts to find out what was causing the gun not to fire. John quickly had the gun working again. As soon as it was back in action, the enemy charged. With the extra gun now working, Basilone and his unit easily beat back the Japanese attack. The attacks kept coming. John told two of his remaining soldiers to keep the heavy machine guns loaded. John would roll to one machine gun and fire until it was empty, then roll over to the other one that had been loaded while he was firing the first one. At about 3 AM they were almost out of ammunition. The Marines had stored ammunition about 100 yards away. However, this would be a difficult 100 yards. There were enemy troops on both the sides and behind their position. John ran and crawled through the jungle. Bullets flew off over his head and grenades exploded around him. But he continued and made it to the ammo dump. John threw six heavy cartridge belts over his soldier. As he started back to his men, bullets were whizzing all around him again. But he made it back and soon he found another challenge. One machine gun had been smashed. John took parts from another knocked out gun and fixed it quickly. Later in the night, the ammunition ran low again. John would need to go for more, but this time it would be to another ammunition dump, 600 yards away. Once again the Japanese threw everything at him, but he snaked through the grass well enough so that the Japanese could not find a clear target. John made it back with the much needed ammunition which held off the enemy attacks. Finally the attacks ended around sunrise. The daylight revealed a scene of utter carnage on the ground. Hundreds of bodies laid dead in front of the American positions, In fact, the entire Japanese regiment, around 3000 men, had been “annihilated”. On this night of October 24th, and 25th the U.S. had turned the tide of the war and the previously undefeated Japanese were on their way to defeat. For his heroics that night John was awarded The Congressional Medal of Honor. In July of 1943, John was informed that he was being sent home, but there was a catch to it. John would have to go on a “bond drive”. As John loaded up to go home, he told his buddies he would be back, but they did not believe him. 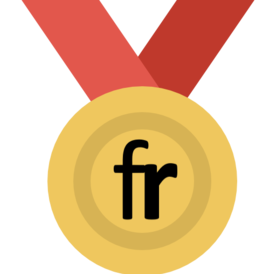 His men figured that with his medal, he could get a safe assignment at home for the rest of the war. His home town of Raritan planned a homecoming parade in his honor. It was held on Sunday, September 19th, 1943. The people of the small town of Raritan were amazed that such a big event came their town. There were 30,000 people, including many politicians, numerous celebrities, and the national press. Life Magazine ran a four page story on the parade. Even the Fox Movietone News video taped the event making a newsreel that was shown at movie theatres throughout the country As a hero, John was worshipped and wined and dined. John said that the admiration and attention was appreciated, but he was a soldier, and that he had given his word to his men that he would be back. John officially asked to go back to his men, but was initially denied. He was told that they needed him more on the home front. He was offered a commission (an officer’s job), but he turned it down, saying he was a plain soldier. He was offered a job as an gunnery instructor. To John, these soft, easy assignments did not seem right. He had a strong sense of purpose, and a safe easy job while there was a war going on was not his idea of being a Marine. After a few months he asked again to go back overseas and this time he was granted his wish. For his assignment, Basilone was to report to Camp Pendleton in California to train with a group that was preparing to invade an island in the Pacific. So on December 27th, 1943, John left the easy life of a hero on the home front to return to the soldiers who would soon go back overseas to engage the enemy. In the final analysis battles are won not by machines but by men trained to fight, wanting to live, but unafraid to die. Iwo Jima has come to symbolize the courage and offensive spirit that brought victory to the Armed Forces of the United States in World War II. On February 19th, 1945 the Marines arrived at Iwo Jima and were ready to attack., The Navy had bombarded the island for 36 days. Some Marines hoped this intense bombing would allow them to take the island with little resistance. However, there were 22,000 Japanese warriors who were well dug in, heavily armed, and prepared to die. The first U.S. invasion force landed on the beach at 9:05 AM. John Basilone’s group landed around 9:30 AM. They were surprised to find little opposition. The Marines got up on the beach and noticed that their feet could barely move in the soft black volcanic sand of Iwo Jima. For one hour, the U.S. was able to get their transports up to the beach and unload the men without major resistance. Then, with the beach crowded with U.S. soldiers, the Japanese began their counter attack. Suddenly the Japanese from their hidden blockhouses began firing away at the exposed U.S. troops. The Marines were getting annihilated. Survivors later wondered how anyone survived the initial Japanese barrage. The U.S. forces were on the beach, but they had little or no cover, were still disorganized, and had not yet gotten enough heavy equipment ashore to defend against this type of attack. The troops had trained for years, but nothing could prepare them for what was happening all around them. The soldiers would later say how frustrated they were that they could not see the enemy to fight back. The Japanese counterattack had stalled the U.S. invasion. Most Marines were hiding in the sand. The beach was littered with damaged vehicles, equipment, and dead soldiers. The invasion was not moving. Brave men with leadership ability were needed to rally the troops. John Basilone rose to the occasion. Many survivors of the battle recall that in the midst of the battle, with everyone hunkered down in the sand, there was one Marine out in the open, running around, directing men. It was John Basilone. He first guided a tank out of a mine field. Only a few tanks came a shore and they were needed to knock out Japanese blockhouses. John had noticed a particular Japanese bunker had been effectively shooting mortar shells and raging deadly fire upon the U.S. troops. This enemy strong position “had to go”. John found and organized some machine gunners along with demolition men and directed them toward the bunker. John Basilone instructed a demolition man to blow a hole in the concrete structure, while others gave cover against other nearby enemy positions. A large explosion went off opening part of the bunker. Basilone then told the enthused machine gunners to hold their fire and directed a flamethrower operator to charge the pit. The brave flamethrower charged the pit as quickly as he could, stuck his nozzle in the pit and ignited the flame. Some of the Japanese soldiers ran out of the pit screaming as they tried to wipe away the jellied gasoline that was burning them. John Basilone cut them down with a machine gun. Fellow soldier, Charles Tatum, said “for me and others … who saw Basilone’s leadership and courage during our assault, his example was overwhelming.” After knocking out the bunker, Basilone led twenty men off the exposed beach area to a location where they could take some cover and plan their next move. He ordered the men to stay while he went back to get more men and some heavy machine guns. John Basilone gathered some troops and weapons and started back across the beach to the waiting soldiers. But John was hit with a Japanese mortar shell which landed right in the middle of him and the men he was leading. He died from his wounds around thirty minutes later. 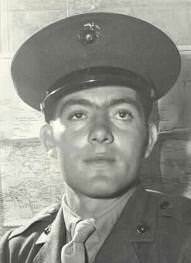 For his actions that day, John Basilone was awarded The Navy Cross. The military paid tribute to John by naming a ship after him. An anti-submarine Navy Destroyer, the U.S.S. Basilone was commissioned on July 26th, 1949. His home town of Raritan honors him every year with a parade. The first parade was in 1981. For 22 years, the parade has been held, rain or shine. It attracts thousands of spectators. It is the pride of the town of Raritan. John Basilone remains the only soldier (non-officer) in U.S. history to be awarded both The Congressional Medal of Honor and The Navy Cross. He is also the only Medal of Honor winner to go back into combat and be killed in combat.